OK so you are tired just came home and want a quick meal of your fresh catch. Well here it is, this can be found in many recipe sites and can be modified as much as you want, after all you will be eating this dish to your liking. Preheat oven to 450 degrees F (232 degrees C). Use aluminum foil to cover a baking pan. In a bowl, marinate the fish fillets in the salad dressing for 10 minutes. 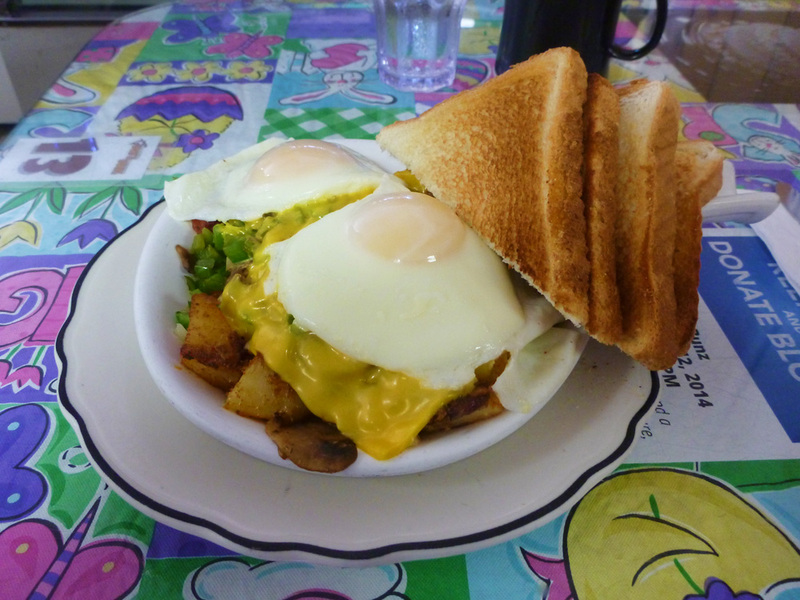 Crush the chips and toss the shredded cheese and crushed chips together. 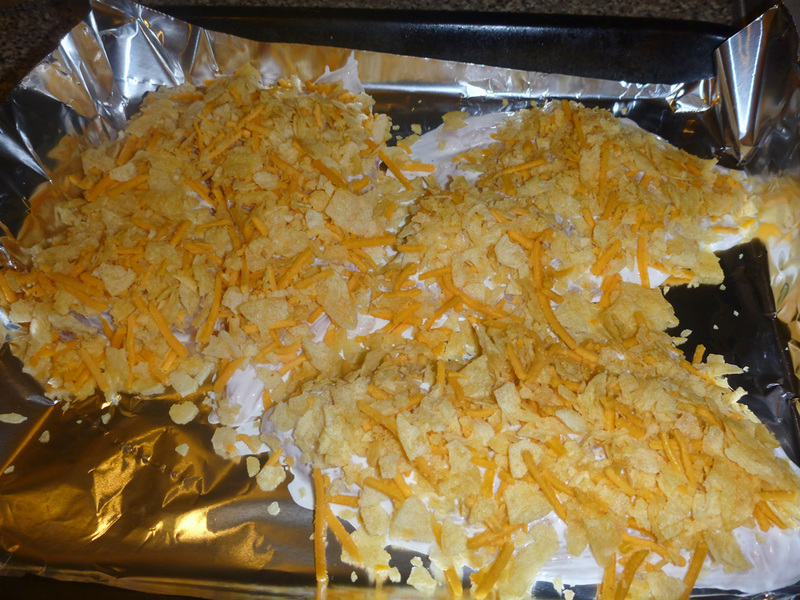 Place the marinated fish fillets in the baking pan and top with the cheese/chip mixture. 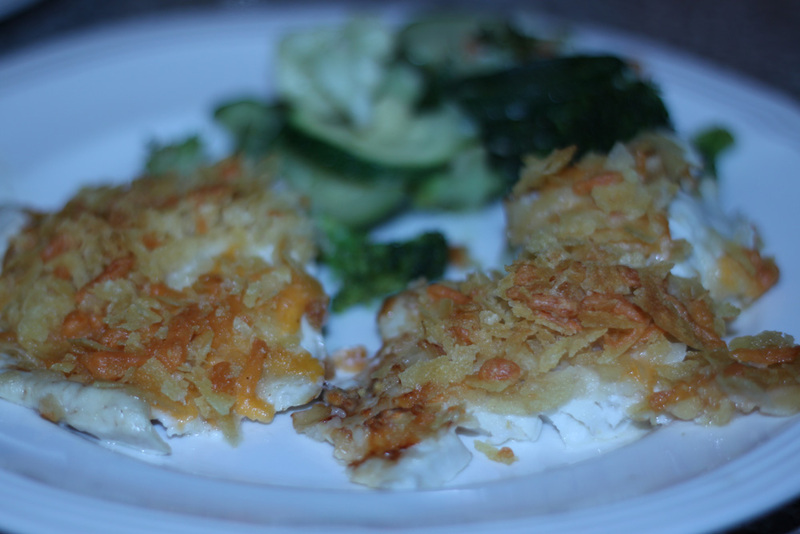 Bake, uncovered for 10 to 15 minutes or until the fish is soft or flaky (test with a fork). 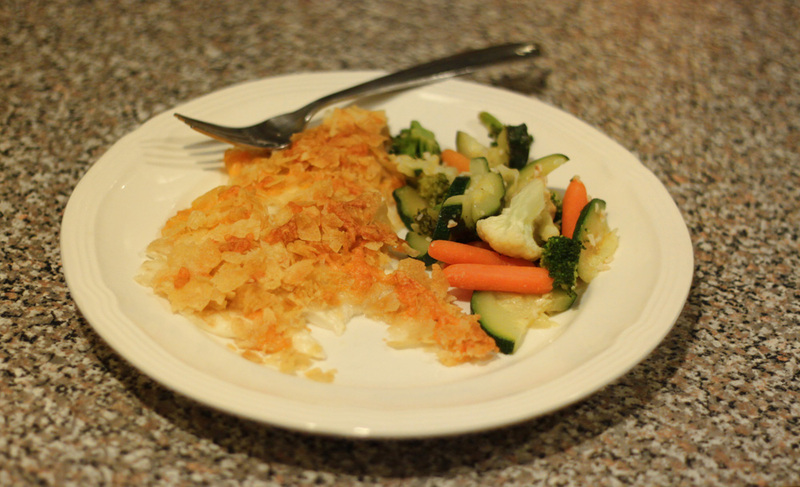 You can use plain corn flakes instead of chips or baked veggie chips. You can use lite dressing. Want it like potatoes Au Gratin and fish? Cook it longer at lower heat and then let it cool and store in the refrigerator over night, take it to work and at lunch time microwave it covered. The darker the cheese the crunchier the chips.Just don’t burn it! Below is a pic of the Hogfish and Permit on the same baking pan. Below is the Hogfish with some extra cheese and chips. If you use a sweet salad dressing it may get stuck on the aluminum foil so try to avoid that. Below is the Permit with the crisp cheese. You can see the flaking of the fish on the sides. Sip some wine and enjoy the meal! Enjoy fish the way you like it! A nice glass of white wine will go well, but I prefer a nice Vintner’s Red Premium Wine. 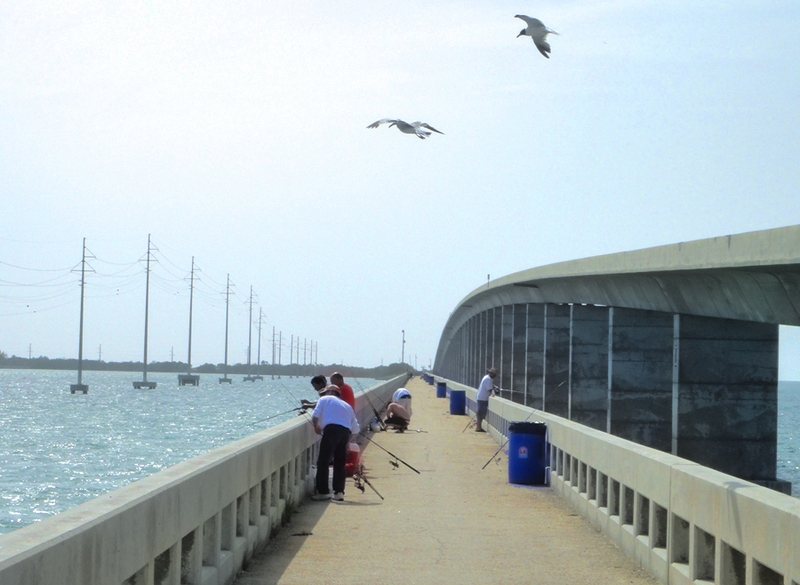 I wanted to go fishing to one of the Florida Key’s bridges this weekend. I had very little time to fish in mind and had to make the best out of this 1.5 hour drive plus stops at the bait shops in the hunt for blue crabs since I wanted to get a shot at catching a Permit Jack. Anywhere I go fishing is about 1.5 hour drive upwards to a 4 hours drive so I have to plan things to work out for the best. I had no idea where I needed to go until I saw the tide tables and figured I best go fishing to a bridge where I can fish both sides of the fishing bridge. The closest to me where I could do that was Channel 5 Many of the old bridges have been updated with new railings, and some with platforms. Channel 5 has not fitted with platforms but they did redo the parking lot. In my opinion they did great by not adding these platforms. Lots of people like them, I just have to get used to having them. They kind of get in my way when I have a big fish on, but I have to live with it. Back to the trip; I was happy when my wife offered to come with me since it is a pain to land a fish solo plus I had my personal photographer, what else could I ask for? We were up by 2:30 a.m. and loaded my little square box of a car, off to get gas and to the first bait shop. 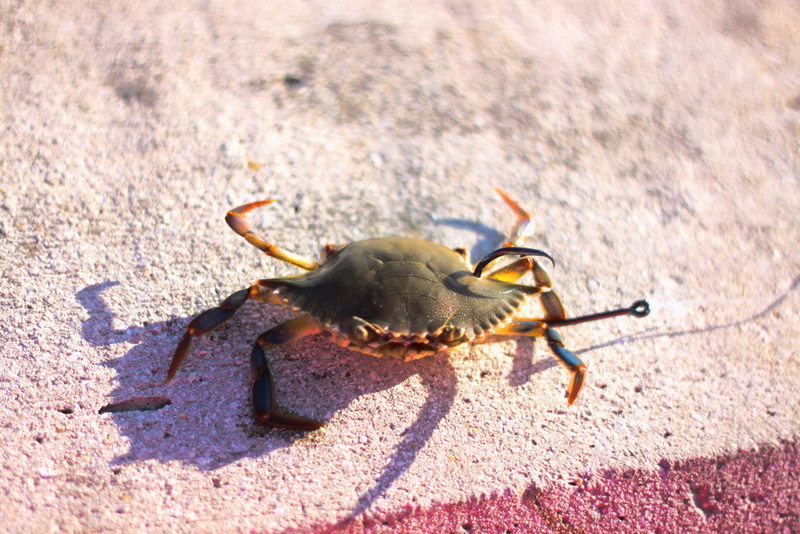 We stopped at Jack’s in Florida City and I told my wife “if there are no blue crabs we are going back home”, well, they had 5 crabs so I was ok with 5 since I was only planning to fish 1 hour before the tide change and about 2 hours after the tide change. 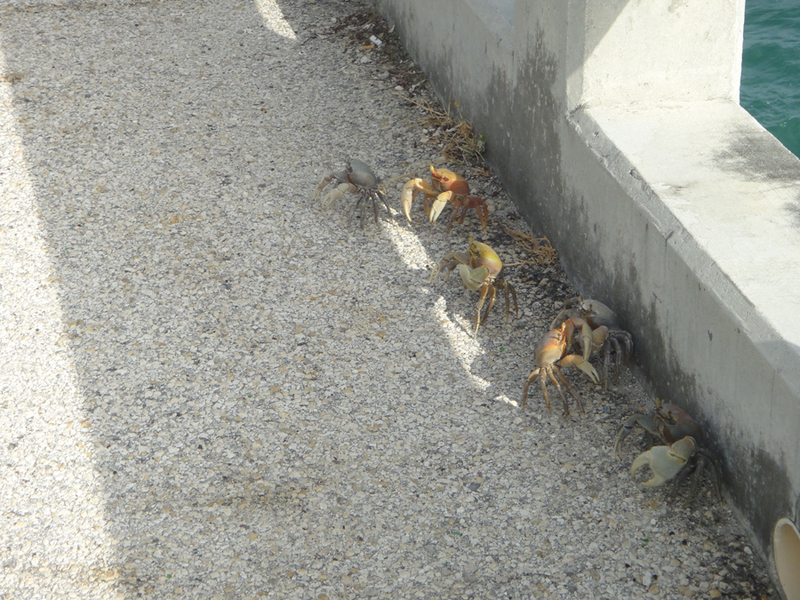 More than enough time and had to hope that no puffer fish would eat my blue crabs. I also decided to get some of the brined sardines and thread fin herrings they usually keep in a cooler. As always I picked the ones that had better eyes than the others. No glassy looking eyes. After Jack’s we went to the gas station next door grabbed a few snacks and by now I had wasted 1.5 hours of my time. We got back on the road and wanted to stop at Bud and Mary’s bait shop since they open early sometimes but this time it was closed and would open at their normal 6 a.m. schedule. No time to wait so I kept going. As I was driving I was going on my list of things to bring and realized that I did not bring a bait knife so I had to turn around and make another stop for te knife and also got some frozen shrimp that did not look bad so at least I would have a backup plan in case the permit did not go for my blue crabs. Back in the car and off we went, after so many stops we got there at 5 a.m. right at the slack tide. We unloaded everything and went on the way. When we arrive we took some pics of the sunrise. We got there, we setup our rods, and a FWC (Florida Fish and Wildlife Conservation Commission) officer passed by inspecting our cooler. I was glad to see the officer doing his job. 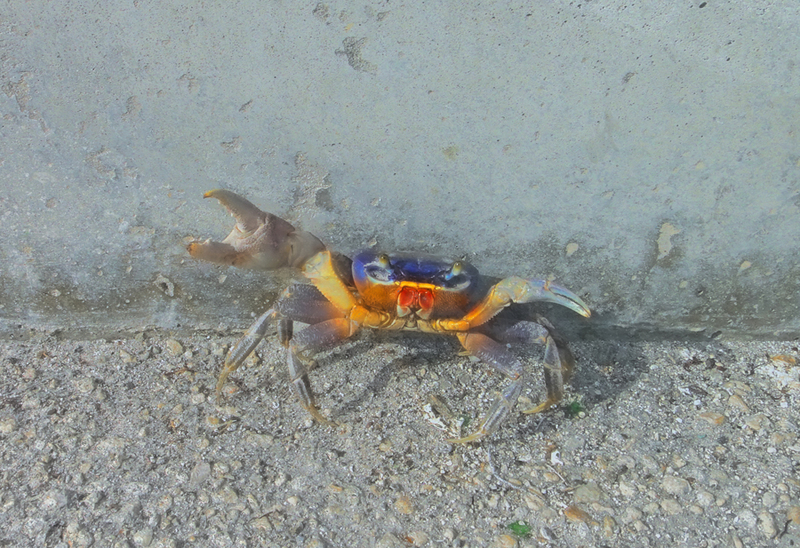 After he left I cast one of my blue crabs as far as I could and another under the bridge. 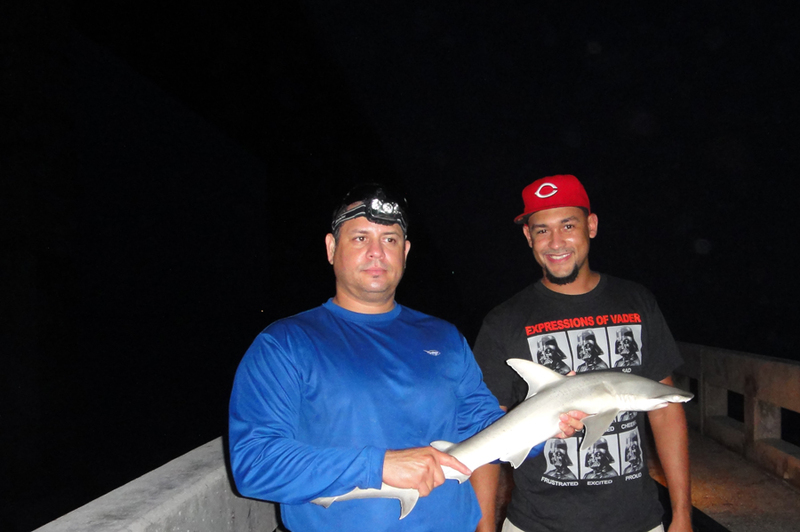 I used 9 foot long fishing rods and reels loaded with 40 lb test line and 50 lb test line. 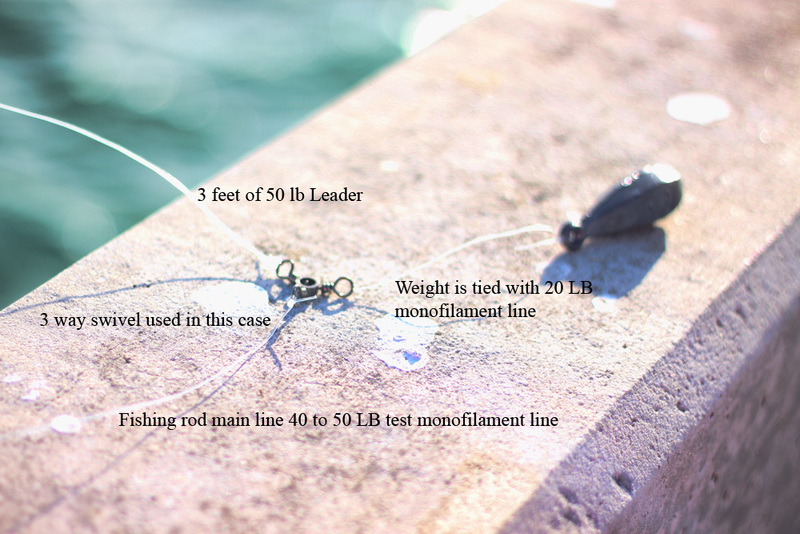 The one with 40 lb test line could cast farther out and the one with 50 lb was just placed under the bridge and the thicker line could take the abrasiveness of the sharp edges. The third rod I had was a light tackle rod and reel with 6 lb test monofilament line, this rod was set up for snappers with a troll right jig head (hookups lure). 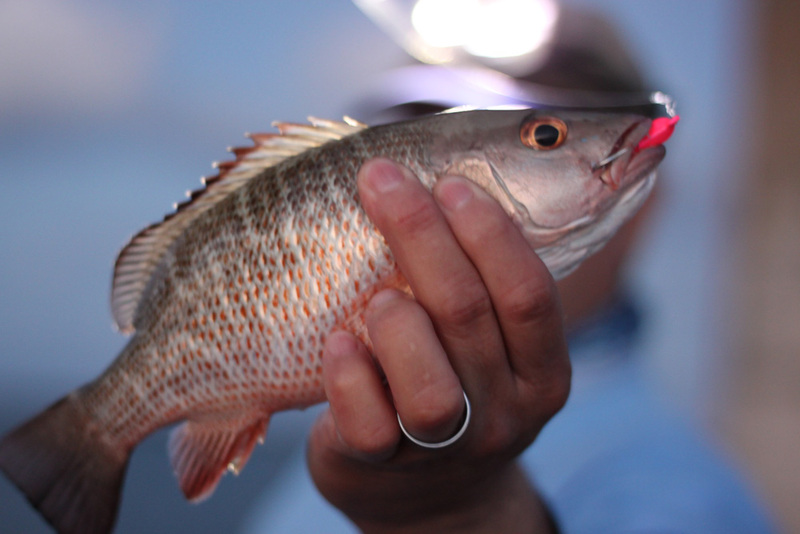 I started using the shrimp and sardines to see what was biting best and found the shrimp was the bait of the day for snappers. 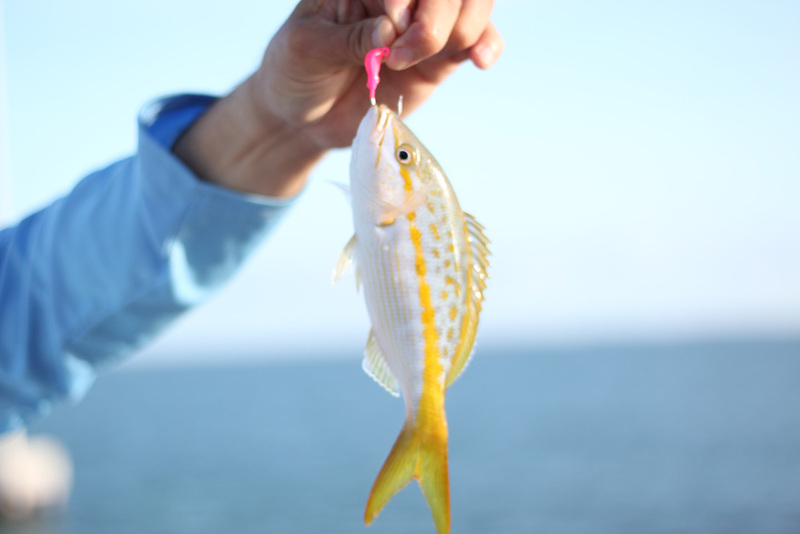 A fourth rod was kept with a white buck tail jig in case a school of jacks or mackerels made an appearance. 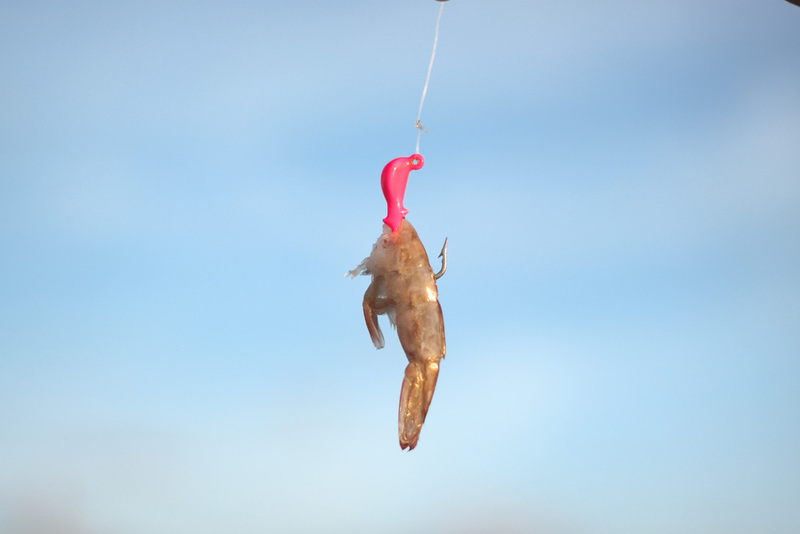 Below is what the jig head looks like and how I was using the frozen shrimp with it. 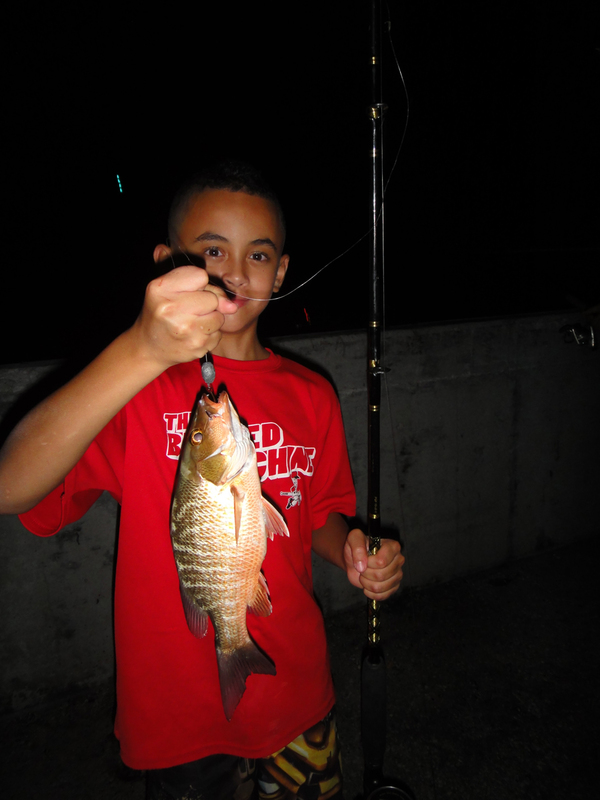 I started catching a few snappers in the 11″ range, like the one below, but I released all of them. It was the almost 6 a.m. and the tide started to change. Then all of a sudden I hear click click and my wife screams the reel is clicking. I ran to it and it was just seaweed so I tighten the free spool a bit to avoid that from happening again. I cast again and walked back to the snapper rod. 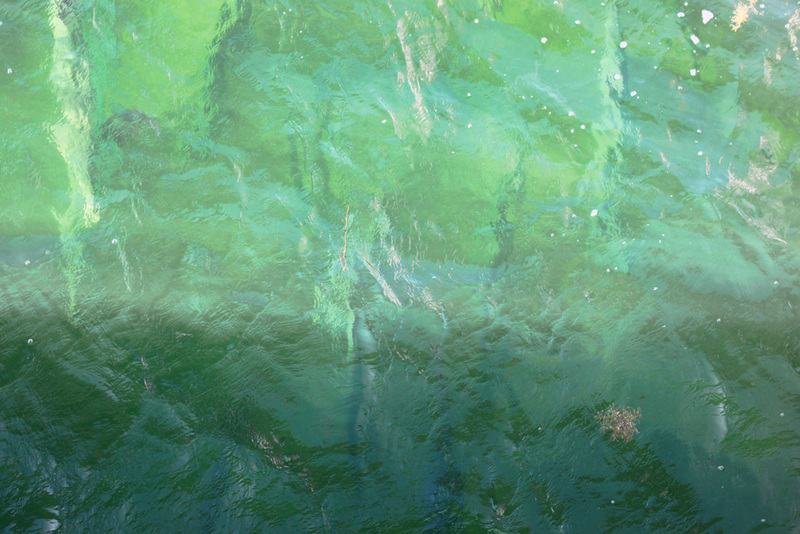 As I cast the rod I hear click click again on the same rod I had just cast, knowing it might be seaweed again I still ran to it. I pick it up engaged the lever, undid the clicker and started to reel it in when zzzzznnnn the line starts going in circles, I immediately tell my wife to please get the landing net and as she does the fish starts to run against the current and heads under the arch of the bridge. I walked left and extend the 9 foot rod out as much as I could and started to reel as slow as possible hoping for the fish to go the other way towards open water and he does, but then again the reel starts buzzing with the fish dashing through the water, another run and this time parallel to the bridge as I run with it reeling line in and keeping tension trying to guide the fish to open water again the fish went under the bridge and doing so while rubbing the cement arches a painful hold and pray the line does not fray. 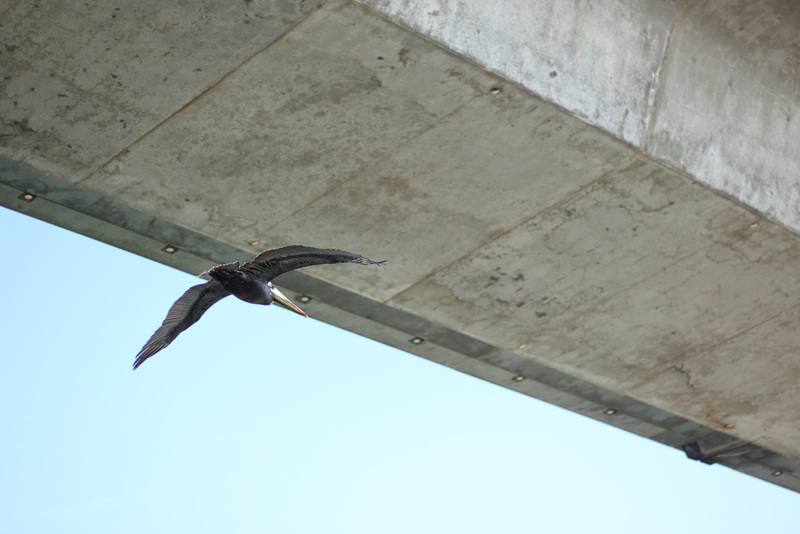 I pointed the rod’s tip towards the water and I asked my wife to hold the rod a second while I went under one of the bridge’s cement rails and this time I had my rod tip pass the concrete arch and was able to slowly reel in the fish as the line rubbed against the opposite end of the bridge. Patiently I reeled inch by inch and I finally had it next to the bridge and with it’s head out of the water so I asked my wife to lower the landing net. It took a few tries as these fish are a bit wider than most, but she finally did it. 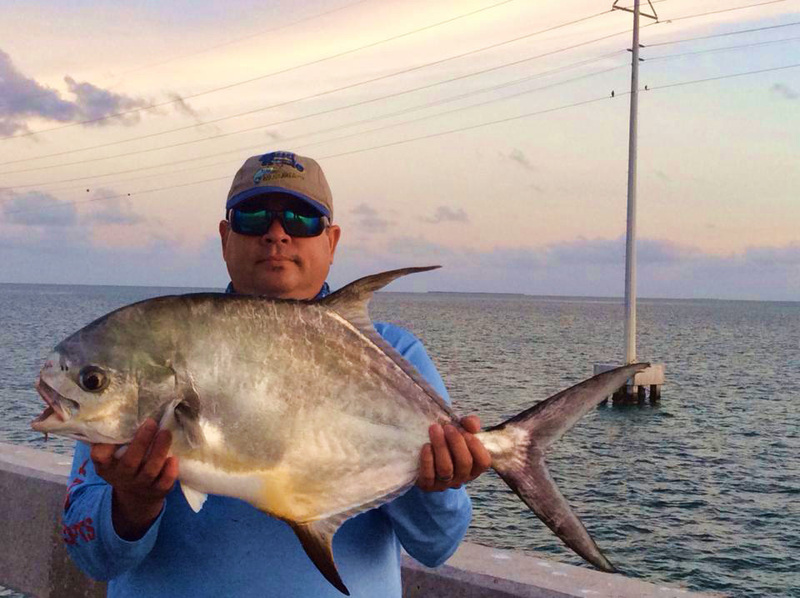 Blow is the rigged Blue crab as it would be used to fish for Permit. Below is one of the rigs as it would be used for Permit. 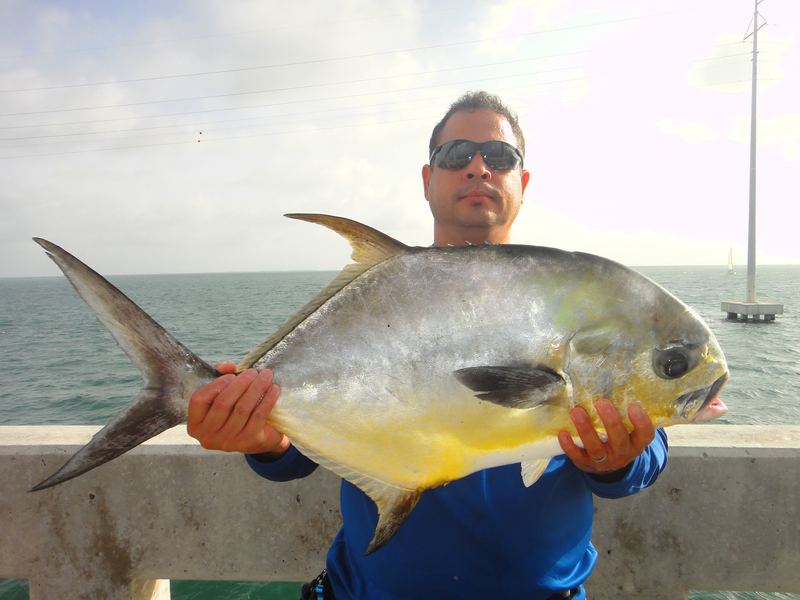 Once this permit was landed I did loose a bite on a big strip of threadfin herring due to a ghost lobster trap. I could feel the line rubbing against it and as I was reeling it in I felt the weight of the trap coming in. The line snapped and I lost the fish never to know what it was. 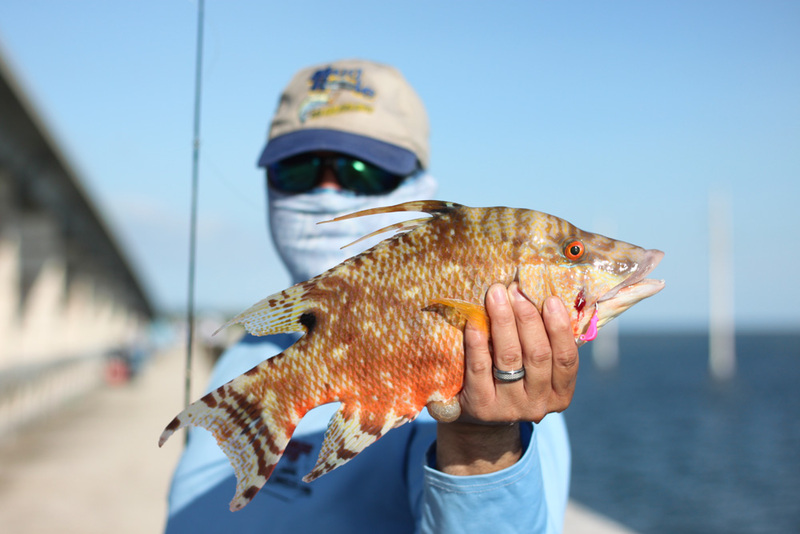 I continued to fish for snapper and it was one after another keeper over 10″ mangrove snappers (Grey Snappers), grunt, and under size yellow tails, were caught and released. 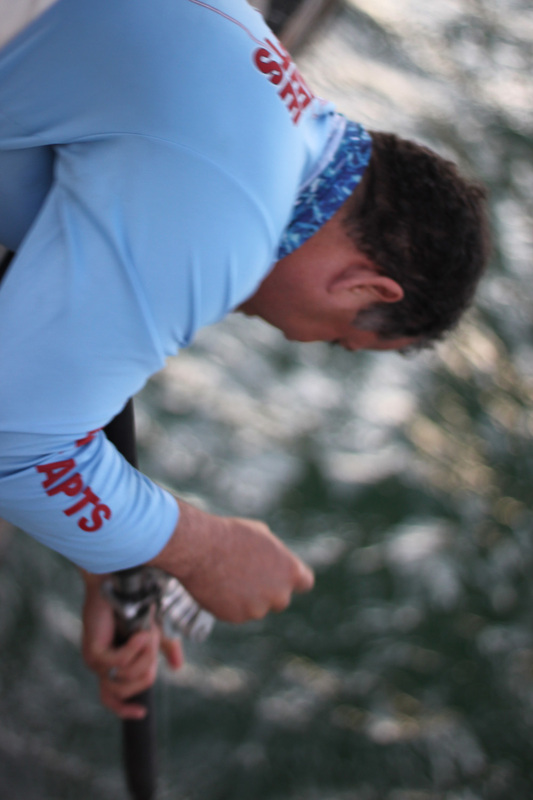 The water started to clear up a bit and a big school of Tarpon were showing up and a few Permit were with them so I moved to another bridge footing and started to toss the jig head with shrimp on it when all of a sudden I get a bite and my line starts to move sideways typical of a Tarpon bite and then followed by a jump. I was using 6 pound test and so there was nothing more I could do other than wait for it to jump and come loose from my hook hoping not to loose my jig head. There was no jump and so I started to reel in the line and what do I see? I nice big head of a Hog fish, one of my favorite table fish. I call my wife and asked her to once again bring the landing net because if I tried to flip this fish over the line would snap. She brought the net and easily landed my fish. As always she was a trooper and took some pics for me. I have thank her so much for keeping me company and helping me with everything. 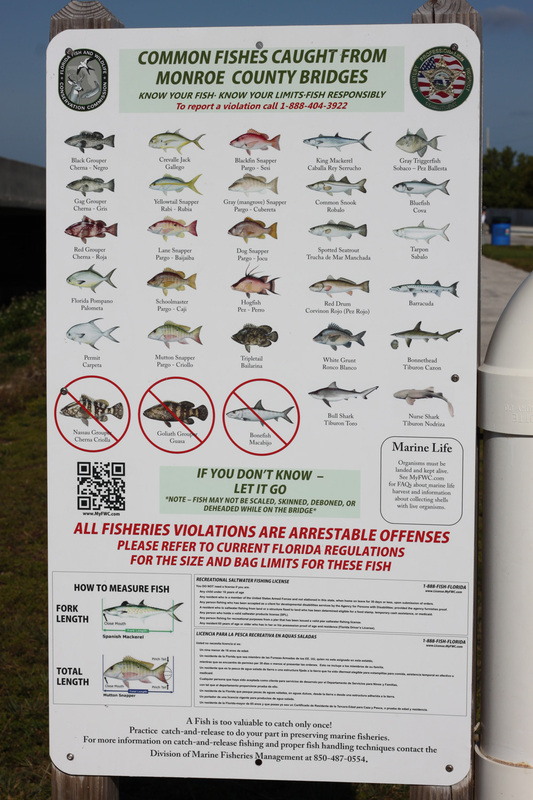 The water became clearer and clearer as time past and the almost rule of thumb is if you can see the Permit you will not hook one up. So we decided to leave. On the way out we snapped some pics of the Tarpons. More people started to show up and also many birds looking for an easy meal. While I was fishing my wife took some nice pictures of the birds. As we left the bridge I took some pics of interest for others that have never been there and plan to go there. 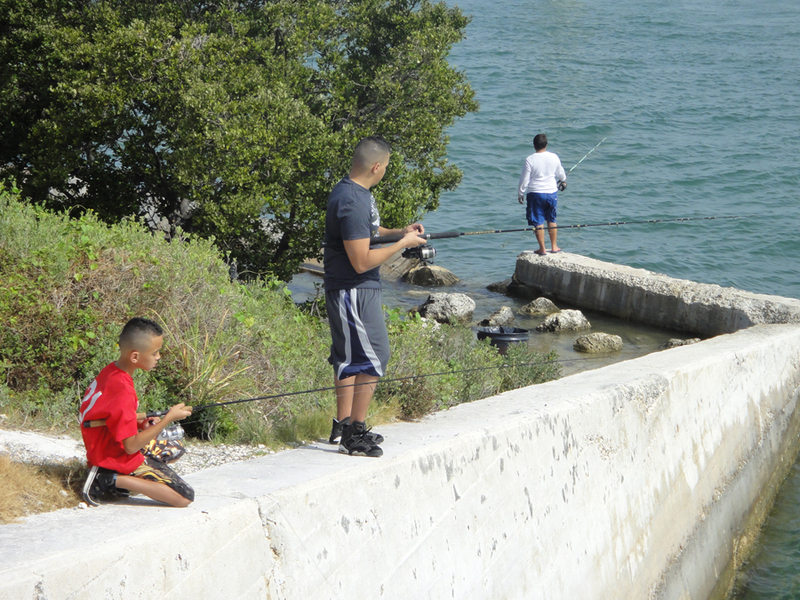 After all the fishing was done we passed by Anne’s Beach Park and took some pictures of it. 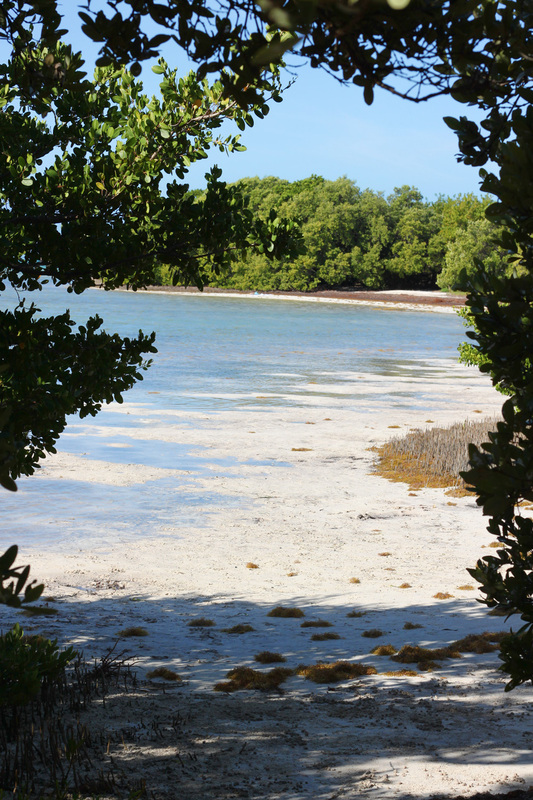 It is a nice beach with free parking as all the fishing bridges are. 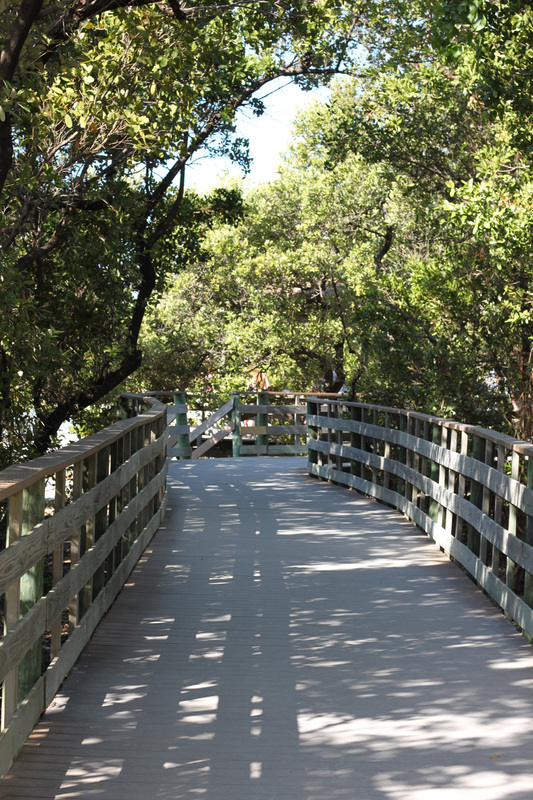 It is a very nice beach with small boardwalks that lead into smaller and then more open beaches to be enjoyed. 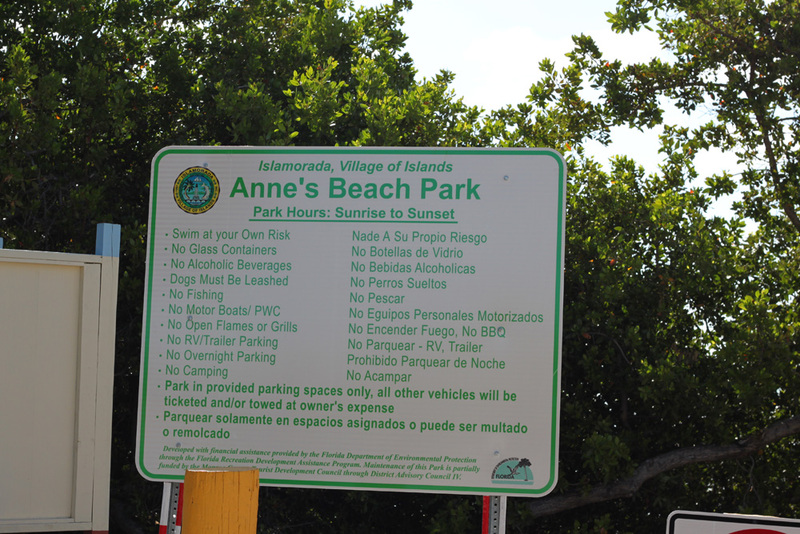 Below are the rules and hours of the beach and a nice set of bicycles. 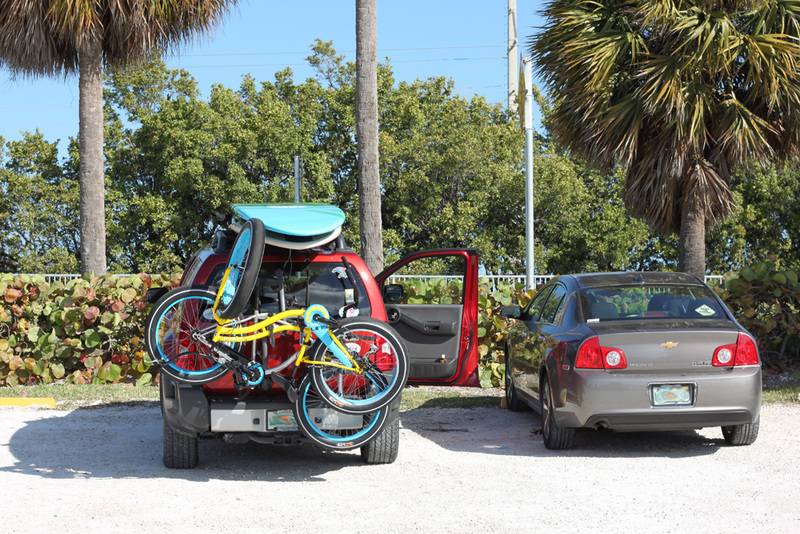 Some days you can observe many colorful and unique bicycles around the Florida Keys. 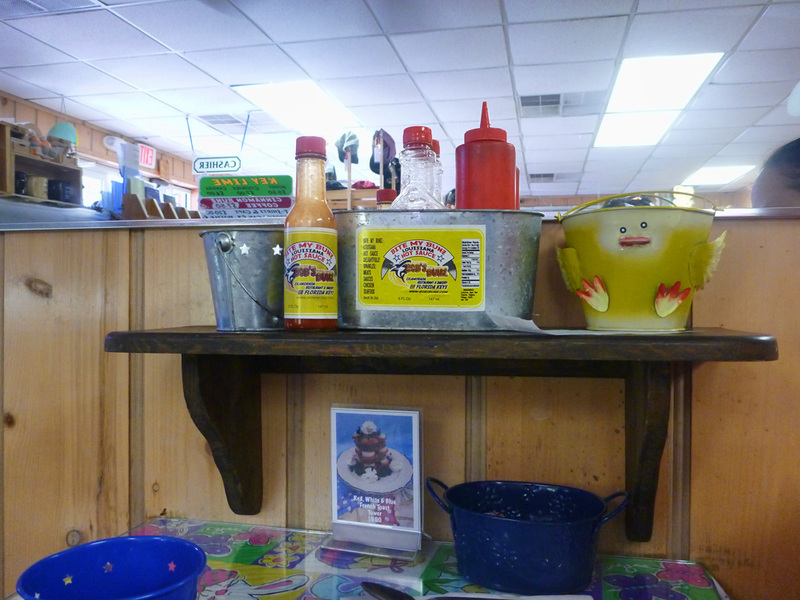 Before we left we made a stop at Bob’s Bunz for a nice breakfast and a taste of the hot sauce. And one last picture for this fishing report slash small tutorial slash public beach information slash restaurant information report. 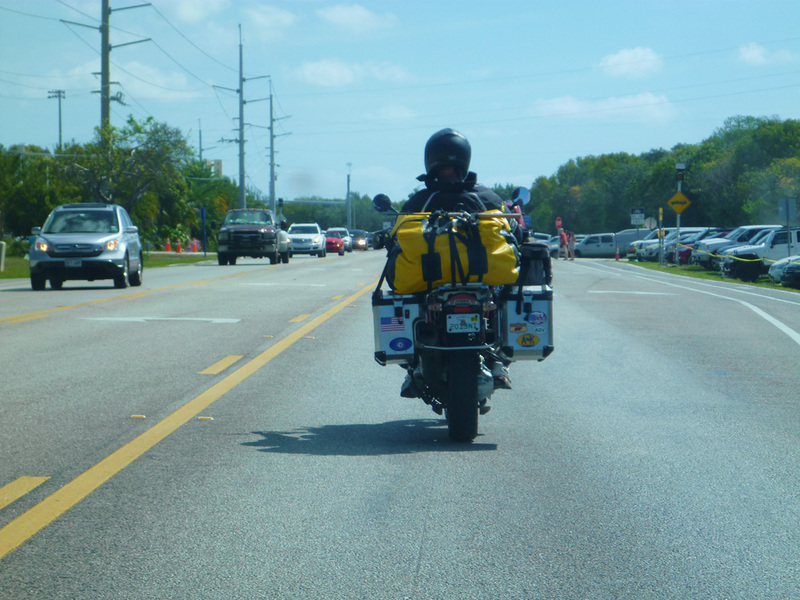 A cool biker taking his belonging that includes a fishing rod into his next destination. 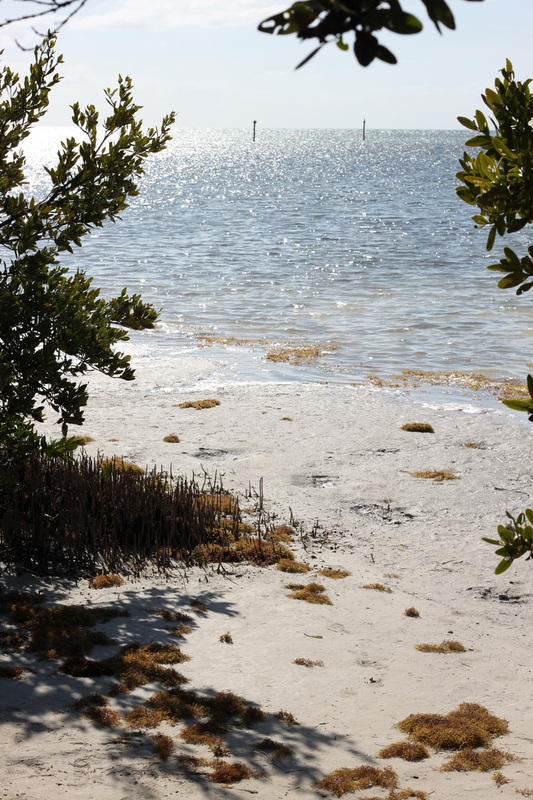 Good luck to him and the many others that visit the Florida Keys year after year for a small or big adventure into these eclectic islands. 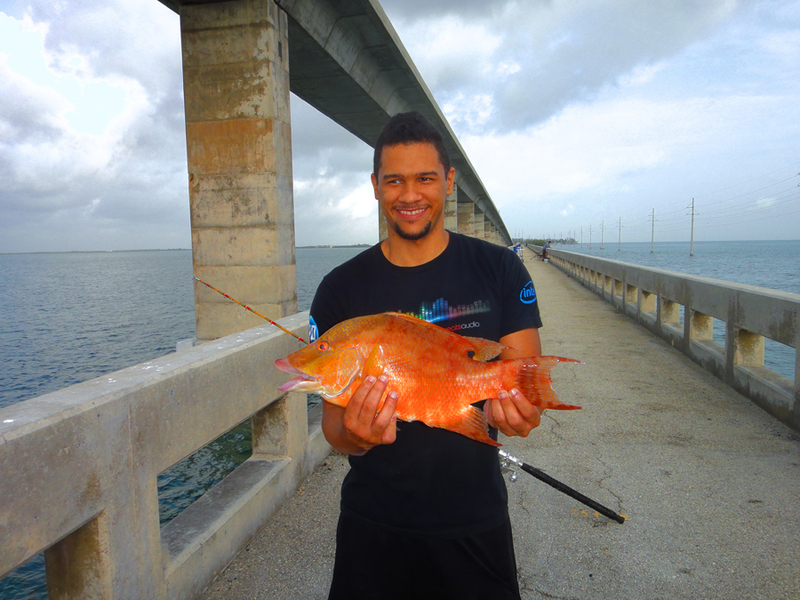 Fishing in the Florida Keys Bridges is always fun, a lot of work sometimes and a lot of walking, but it pays off the more you go. 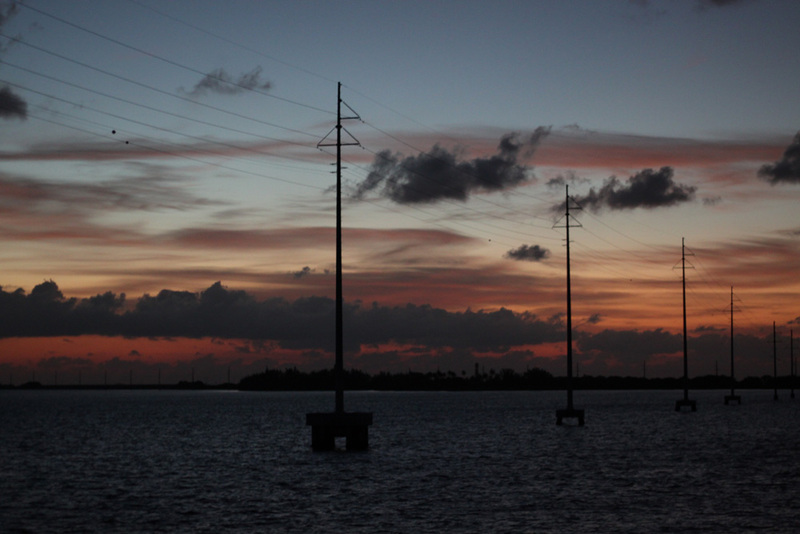 The peacefulness of the night and the sound of the line buzzing out of the fishing reel is what gets the adrenaline jumping and is what many fishermen seek. Again thanks for reading and I hope this post helps someone in the future to land their prize catch or at least dinner.